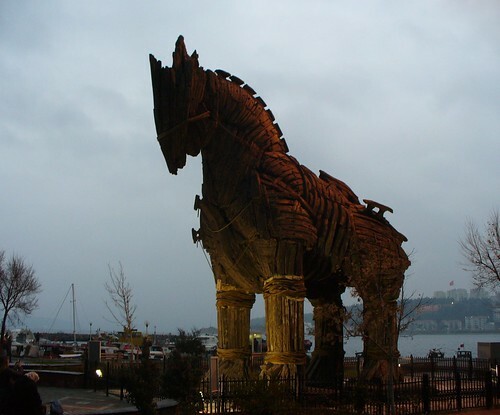 Travelogue of An Armchair Traveller: The Trojan Horse of Troy is in Turkey! 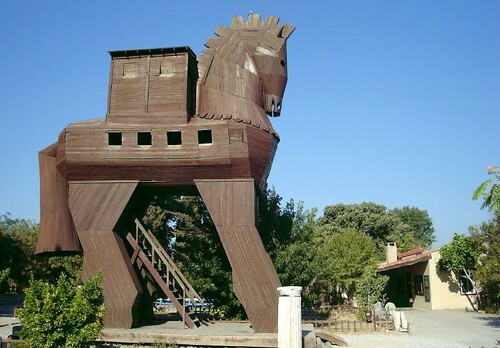 It may come as surprise to many but, as per archaeologists, the legendary town of Troy existed in in Anatolia region of north west Turkey and NOT in Greece. 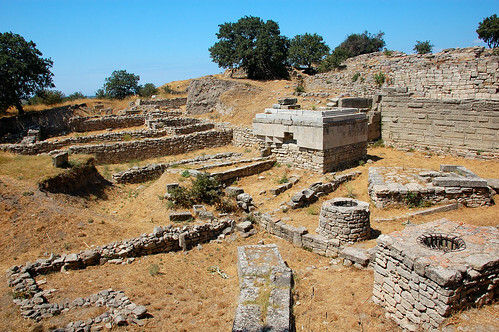 In 1865 an English archaeologist, Frank Calvert had started trial excavation in a field near the small Turkish town of Truva and in 1868 a wealthy German businessman, Heinrich Schliemann also began excavating in this area. Later on several other researchers also began exploring the ruins and the these excavations revealed several cities built in succession to each other. So far traces of habitations from a 5,000 B.C. to settlements dating to 50 A.D. have been found. One of the earlier cities, labelled as Troy VII, is generally identified with Homeric Troy. 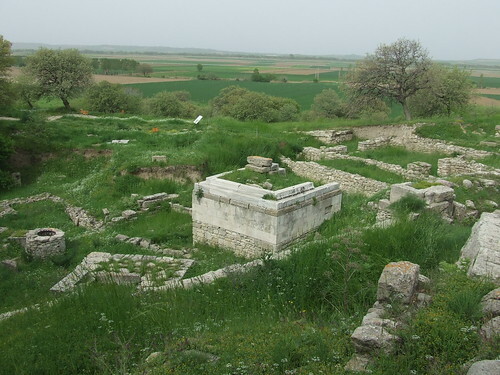 In 1996 the Turkish government declared the archaeological site and its surrounding area a national historical park and gave it an official name of Troia. It is also listed in UNESCO list of World Heritage Site. Soon thereafter it became a tourist spot and the small township of Truva adjoining the archaeological site grew up to cater for the tourist trade. A large number of tourists who visit the site each year, see a highly commercialised site, with a large wooden horse, souvenir shops and a museum. 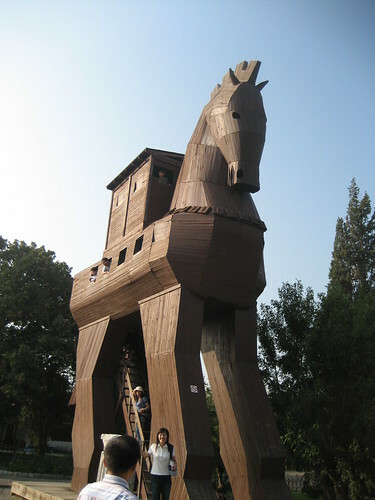 The modern day Trojan horse is 30-foot-tall work of Turkish artisan Izzet Senemoglu. It is very popular with tourists especially the kids. 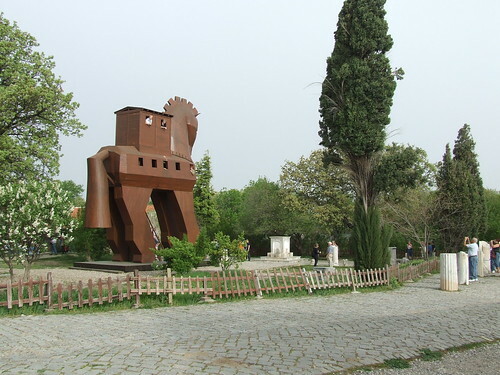 It may be noted that besides above Trojan Horse another version of the horse exists at the nearby coastal town of Çanakkale. 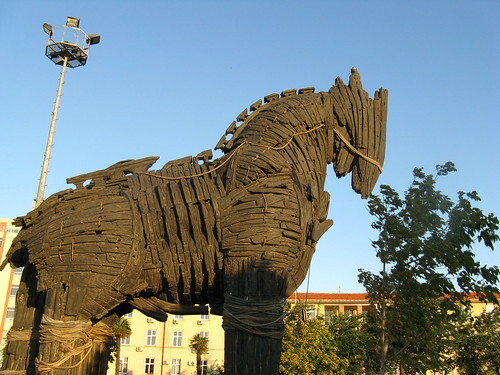 The second horse was made for the 2004 Hollywood movie "Troy" and reportedly Brad Pitt gifted it to the town. Many feels this horse is a better representation of the legendary horse as it is made with technique and material like lumber strips, rope and tackle which would have been easily available in the epic's era. The second horse is commonly referred as the Hollywood's Trojan Horse or Brad Pitt's Trojan Horse.